The University City Science Center is the nation’s first urban research and office park, founded 50 years ago to attract and maintain high-tech industries that seek to capitalize technology that was developed at the city’s many universities, or based on those universities’ research and breakthroughs. It is situated along Market Street, in University City, between 34th and (eventually) 39th Streets, and has 2 million square feet of office and research space in 15, mostly mid-rise buildings, over 17 acres. Vacancy is extremely low and the Center attracts foreign companies and helps incubate new high-tech businesses. The Science Center is undergoing a huge expansion that will add approximately 1.5 million square feet of new office and research (lab) space, an increase of more than 50%. This expansion includes the already under construction 3737 Market, at 38th and Market Streets, and soon a new highrise office building at 34th and Market Streets and a larger office complex at 38th and Market Streets. While the Science Center is a relatively successful urban research and technology center, it is mostly a business district, not a neighborhood, and it has not been very active in the evening and on the weekends. The leadership of the Science Center has started to try to make Market Street livelier, in an urban way, by adding more retail and restaurants to new construction, but now they want to take that to a new level by building a large highrise apartment tower at 36th & Market Streets, on a current surface parking lot, that will start to create a true neighborhood for the Science Center and a community of high-tech workers in University City. The tower will be developed by Wexford Equities, a subsidiary of Wexford Science and Technology, a major landlord of office and research space in the Science Center, and Southern Land Company, and it will be designed by BLT Architects. 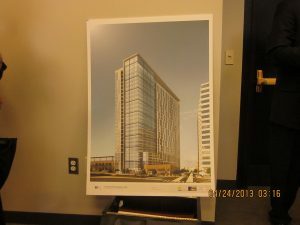 The new apartment tower has received approval from the City Planning Commission, last week, and from the Zoning Board of Adjustment, just yesterday, April 24. The land will be owned by the Science Center and a final agreement with the Philadelphia Redevelopment Authority will be finalized within the next month. Once that agreement is finalized, then the tower can start construction. Officials at the Science Center believe that they will start that construction in the autumn. The new tower will be 27 storeys and 310 feet tall, making it the tallest building in the Science Center and the tallest on Market Street in University City. It will be at an angle, right on Market Street, but set back from 36th Street, perhaps to allow sunlight onto that block because the 18-storey tall 3535 Market Street building is across 36th Street. 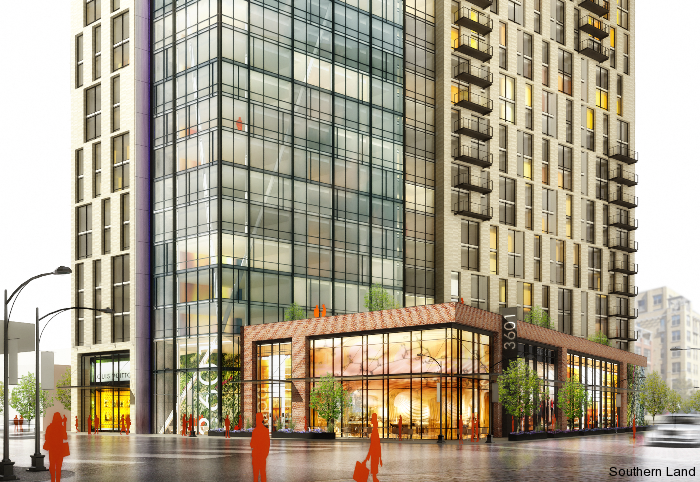 The apartment tower, officially at 3601 Market Street, will have 362 apartment units of different sizes, 15,000 square feet of retail space on Market and 36th Streets, 194 parking spaces, and 121 bicycle parking spaces. The entire building will have approximately 413,000 square feet of floor space. The entrance to the apartments will be on Market Street and the retail on the first level will stretch all the way to 36th Street (the developers hinted at the recent Planning Commission meeting that they may sign a large tenant for most of the space). The facade of the tower will have large-paneled windows, at the corner of 36th & Market, and staggered windows along the rest, with balconies. The parking garage will be three levels above ground and visible above the retail portion, but it will not stretch all the way to 36th Street, and it will have its entrance on Filbert Street on the northern side of the building. There will be a green roof over the one-storey retail portion and a sign saying “3601” (if the Art Commission approves it). The developers believe that building the parking garage underground is impossible, because soil testing revealed some toxins from the site’s once industrial past, and that building underground would expose these toxins when they must be properly sealed with concrete. The developers will plant new street trees on 36th Street, which currently has none at this corner. This is another big deal for University City, which as I’ve said recently, is experiencing a building boom that is giving the neighborhood a dramatic new skyline and a mix of new residential space, for both students and workers, as well as quite a bit of new office, research, academic, medical, hotel, and retail space. This new apartment tower (and a similar 25-storey apartment tower being built by Radnor Properties at 38th & Chestnut Streets that I recently wrote about) will bring new housing for those in the workforce to add to all the student housing and create a community of high-tech and university workers. It’s important for the city to have workforce housing in downtown, much like the new housing being built in Center City, west of Broad Street, between Chestnut and Arch Streets. That area was once mostly just office buildings with only a few apartment and condo buildings, largely for retirees. But, new apartments and condos are being built throughout that area of downtown, making the growing neighborhood busy in the evenings and on weekends, and helping to attract and retain corporate offices in Center City. This new tower will have easy access to Center City, with the Route 10 trolley passing right by and the 34th Street subway station a block away (35th Street doesn’t intersect with Market Street, apparently). The regional rail is a few blocks away, also, at 30th Street Station. The new Science Center apartment tower will, also, have a positive effect on Powelton Village, creating a new gateway to the neighborhood, and Lancaster Avenue in particular. Lancaster Avenue is not as busy in the evenings as it could be, and several blocks and intersections have high storefront vacancy. This new tower could bring up to 500 new residents, with good paying jobs, and that along with a new Drexel dorm at 34th & Lancaster that I will be writing an article about very soon, will bring many new residents and consumers to Lancaster Avenue. The intersection at 36th & Lancaster, in particular, could benefit. Currently, all but one storefront at that five-point intersection are vacant. The latest vacancy is at the southwestern corner, where the Mexican restaurant, Zocalo, recently closed up. That corner space does have a new tenant, which will be a Middle Eastern cuisine and hookah restaurant, called Aloosh, owned by Samer Albarouki, who also owns Ed’s Buffalo Wings and Pizza a few doors down on Lancaster, but the new residents and consumers (along with some new pedestrian lights that are going to be installed along Lancaster up to 52nd Street) can ensure that Aloosh stays in business and that new businesses open up in long vacant spaces on the north side of the intersection, and that there are more businesses open in the evenings and on weekends. The new retail in 3601 Market will also connect the retail node at 36th & Lancaster with the retail node at 36th & Chestnut and Walnut Streets, making 36th Street one large retail corridor from Walnut up to Lancaster. It is, also, likely that the soon-to-be closed University City High School property, across Filbert Street to the north of 3601 Market, will be sold to developers and a parking lot across 36th Street from the former high school may be developed by Drexel or the Science Center, as well. All this will make Powelton and Mantua more desirable places to live and will make the Science Center a desirable place to live and attract even more companies to the expanding high-tech business district.